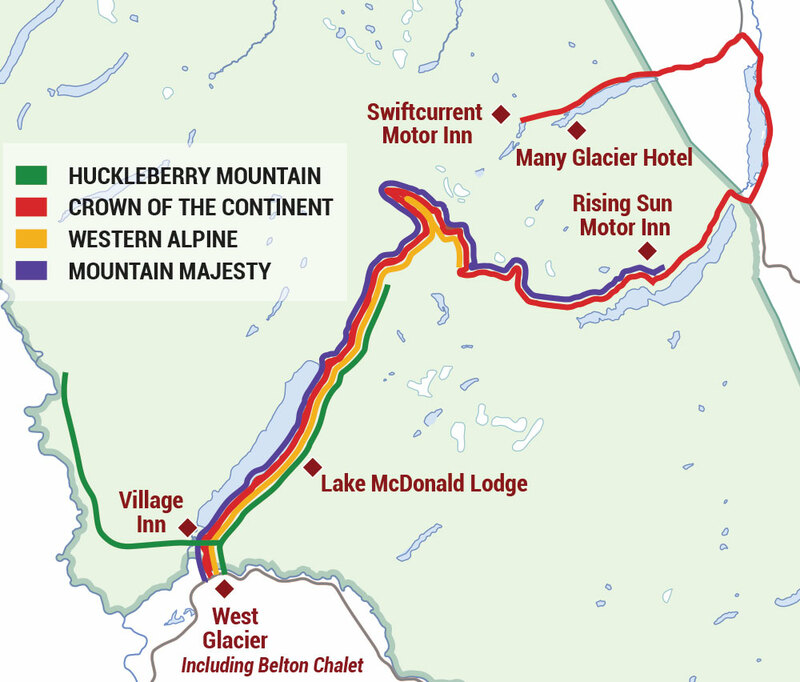 The below tours originate from various pickup locations on the west side of Glacier National Park. Be sure to bring your Park Pass or park entrance receipt on the tour. There are no physical tickets for the tour so please check in at the Front Desk or Concierge Desk at the property at least 15 minutes prior to the scheduled tour time to ensure on-time departure. Tour duration and return times are approximate and may vary slightly. Start your journey with amazing scenic and wildlife viewing opportunities on your tour up Camas Road to the little explored North Fork region of Glacier National Park. Enjoy an easy and optional walk on the Huckleberry Mountain Nature Trail before your return trip through the spectacular burn areas from the fires of 2003. The tour concludes as you delve into the great cedar and hemlock forests that lie within the Lake McDonald Valley on your way to Sacred Dancing Cascade. Departs: 9:00 a.m. and 2:00 p.m.
Returns: 12:30 p.m. and 5:30 p.m.
Departs: 9:30 a.m. and 2:30 p.m.
Returns: 1:00 p.m. and 6 p.m.
Departs: 10:00 a.m. and 3:00 p.m.
Returns: 1:30 p.m. and 6:30 p.m. Please note: Optional walks available on the Trail of the Cedars or Huckleberry Nature Trail. The journey starts in the cedar and hemlock forests of the Lake McDonald Valley. Travel up the Going-to-the-Sun Road along a glacially formed arête to the top of the Crown of the Continent at Logan Pass. Head down through the St. Mary Valley and out to the prairies of Big Sky Country. Continue into the magnificent Swiftcurrent Valley. Enjoy views of the valley during an optional lunch at Many Glacier Hotel or Swiftcurrent. Experience an encore vista on your return trip to the west side. *Please note that lunch at Many Glacier Hotel or Swiftcurrent Motor Inn is not included in the price of the tour, but there will be time for a break and lunch may be purchased at the property. Start the tour in the great cedar and hemlock forests that lie within the Lake McDonald Valley. Traverse the famed Going-to-the-Sun Road to the high alpine region of the park and stand on top of the Continental Divide. Discover incredible mountain ranges, glaciers, waterfalls, and wildflowers along the way as your Red Bus glides along the glacially carved Garden Wall. As of October 4, the Western Alpine tour will only run on Fridays, Saturdays, and Sundays, and all pickups will be at Apgar Visitor Center (note — the tour will not operate between September 16 and October 3, due to construction on Going-to-the-Sun Road). *Please note: extra departures are only available July 1 through September 2. Start the tour in the Lake McDonald Valley, one of the few Montana rain forests. Then traverse along side the glacially carved valley while touring on the Going-to-the-Sun Road over Logan Pass. After a stop at the Continental Divide, head down into the cirques of the St. Mary Valley with an optional lunch or dinner* at Rising Sun’s Two Dog Flats Grill. Returns: 4:15 p.m. and 8:15 p.m.
Returns: 4 p.m. and 8 p.m.
*Afternoon departures July 1 through September 2 only. **Please note that lunch or dinner at Two Dog Flats Grill at Rising Sun Motor Inn is not included in the price of the tour, but there will be time and meals may be purchased at the property.